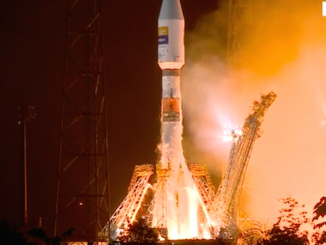 The workhorse Soyuz rocket thundered to life at 11:41 a.m. EDT (GMT-4; 9:41 p.m. local time) and streaked away from the same pad at the Baikonur Cosmodrome that was used to launch Sputnik 60 years ago and Yuri Gagarin, the first man in space, in 1961. 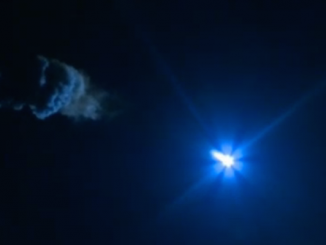 Trailing a brilliant plume of exhaust visible for miles around in the clear early evening sky, the Soyuz booster climbed away directly into the plane of the space station’s orbit, kicking off a six-hour rendezvous. Live video from inside the Soyuz MS-05 spacecraft showed commander Sergey Ryazanskiy, flanked on his left by NASA flight engineer Randy Bresnik and on the right by Italian astronaut Paolo Nespoli, calmly monitoring cockpit displays as the spacecraft accelerated toward space. Ryazanskiy, with a doctorate in biomedicine, is the first scientist-cosmonaut to serve as a Soyuz commander. He spent 166 days aboard the station in 2013-14 and commanded one of three international crews during a 500-day simulated Mars mission in 2009. Bresnik, an F/A-18 pilot with more than 6,000 hours flying time in high-performance aircraft, spent 10 days in space as a shuttle crew member during a 2009 space station assembly mission. Nespoli, making his third spaceflight, has logged 174 days in orbit. If all goes well, Ryazanskiy and Bresnik will oversee an automated four-orbit rendezvous with the space station, moving in for docking at the Earth-facing Rassvet module around 6 p.m.
After verifying a tight, airtight seal, hatches will be opened and the Soyuz crew will be welcomed aboard by Expedition 52 commander Fyodor Yurchikhin, flight engineer Jack Fischer and Peggy Whitson, NASA’s most experienced astronaut. Yurchikhin, Fischer and Whitson have had the station to themselves since June 2 when Soyuz MS-03 commander Oleg Novitskiy and European Space Agency astronaut Thomas Pesquet returned to Earth. The expanded Expedition 52 crew will include four astronauts assigned to the U.S. segment of the station — Fischer, Whitson, Bresnik and Nespoli — and two in the Russian segment — Yurchikhin and Ryazanskiy. The station crew normally is evenly split between the Russians and the U.S. segment, which includes astronauts representing NASA, ESA, Japan and Canada. 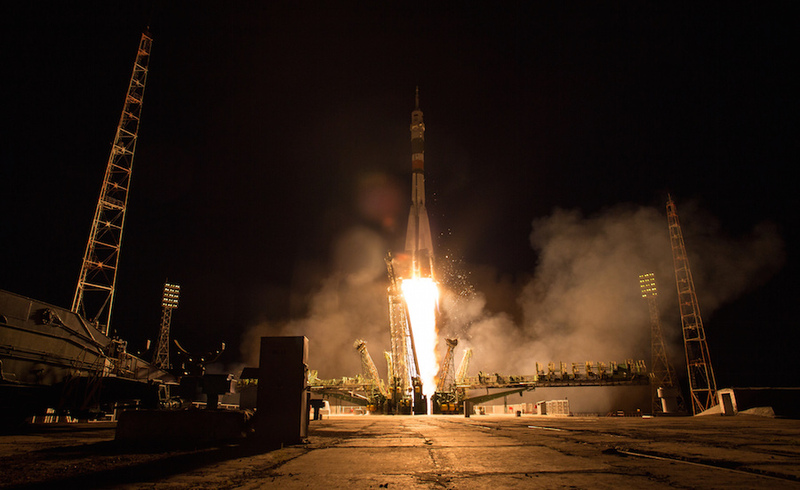 But the Russian space agency Roscosmos recently decided to reduce its crew complement to save money and that opened up additional Soyuz seats for USOS — U.S. orbital segment — astronauts. With the arrival of the Soyuz MS-05 crew, an additional USOS crew member will be available to carry out research. “The big thing is we’re going to have four USOS crew members, and with over 330 possible experiments, of which 85 are new to the space station, there’s a ton of science for us to do,” Bresnik said in a pre-launch news conference. Ryazanskiy, who will join Yurchikhin for a spacewalk Aug. 17, said having only two Russian crew members aboard will require some Russian research to be carried out in their spare time, but he does not anticipate any problems. 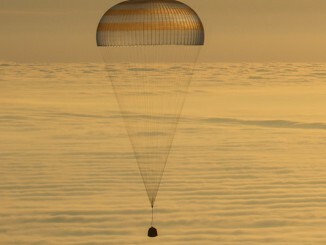 Yurchikhin, Fischer and Whitson are scheduled to return to Earth Sept. 3. They will be replaced 10 days later by Soyuz MS-06 commander Alexander Misurkin, NASA flight engineer Mark Vande Hei and astronaut Joe Acaba. It will be the second expedition with four USOS crew members. Ryazanskiy, Bresnik and Nespoli will return to Earth Dec. 14. Between now and then, the overlapping station crews will carry out multiple spacewalks, help with the departure of one Soyuz, the arrival of another and unload four cargo ships, one Russian Progress, two SpaceX Dragons and one Orbital ATK Cygnus. And throughout it all, the station crew will carry out a full slate of scientific research. “I am excited about having a full complement of people up here who can really utilize this amazing laboratory,” Fischer said in a recent interview with CBS News.